I've been drooling over long pleated skirts lately to wear now with over-sized men's sweaters and then when it gets warmer with a chic tank. I think I may need to get an accordion pleated skirt to dress up for night and a billowy maxi skirt for weekend flea market hunting. 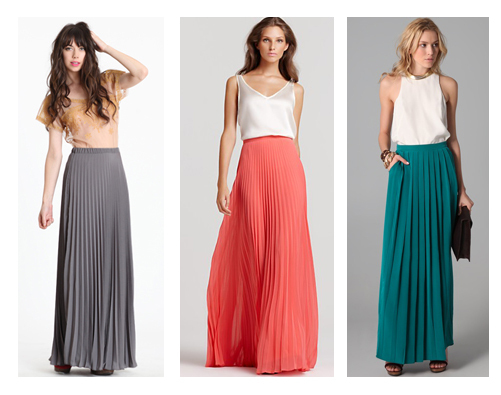 I love these pleated maxi skirts! Great picks! I'm so in love with maxi pleated skirts! I have one from American Apparel (seen several times in my blog) and now I'm waiting for one in moutard colour! I adore the maxi pleated skirts! They are so fabulous...I'm just not sure if I am tall enough to pull it off!